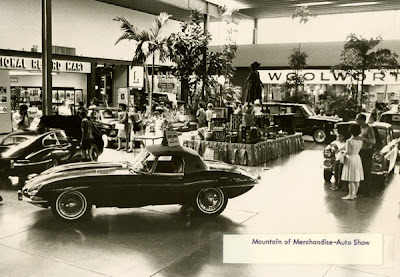 Vintage photo of an auto show underway at Northway Mall in the 1960s (most likely around 1964, I believe). Judging by the pic's label, I'm guessing this was taken during a "Mountain of Merchandise" promotional sales event at the mall. And in fact, if you look real close, you can actually make out what appears to be a literal mountain of merchandise in the middle of the cars. Either way, guesses aside, what I do know is that this is a cool image showing some of Northway Mall 's interior decor in this spacious court area, as well as a Woolworth store and National Record Mart shop, in the background. The depthmess of the black and white just make this a stunning image.